Staying top of mind with influencers like high school and community college guidance counselors has always been a major priority for admissions departments. With many students, meeting with their guidance counselor will play a major role in their higher education decision. The challenge is to stay top of mind when many other colleges and universities are targeting this same group of influencers. 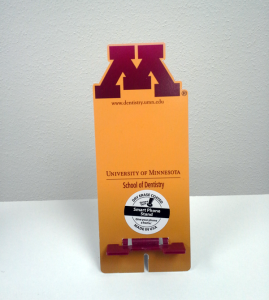 One way to do so is to give counselors an appreciated and useful desk-based promotional product. A desk product will be seen by counselors on a daily basis as well as get noticed by students when discussing their next academic steps. There are certainly a wide range of desk items to consider, but here’s one we really think counselors will use and it’s designed to occupy a prominent place on their desk. Our cell phone stand, called the Wedge – and for good reason as its unique wedge design serves as a perfect cradle for the counselor’s cell phone, ensuring that instead of landing anywhere on the desk, their phone will be put in the same place every day. Since cell phones are often put right next to a monitor, the Wedge often ends up in this coveted viewing space. 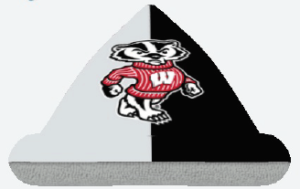 With its full color imprint, the Wedge has endless branding opportunities – giving you the chance to provide a daily reminder of your school’s logo or mascot along with your school colors. Not only will it reinforce your branding message to the counselor, it’s sure to be noticed by quite a few students as well! The Wedge has an added, built-in bonus feature. 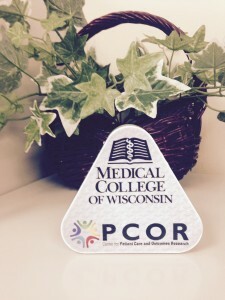 It doubles as a microfiber screen cleaner so that counselors can safely remove dust and smudges from their computer screen and cell phone as well as from eyeglasses or camera lenses. Microfiber traps the dirt within the fibers so nothing is left behind, and since no chemicals are used, there is no sticky residue. Once counselors use it, they’ll be glad to have it so readily available. 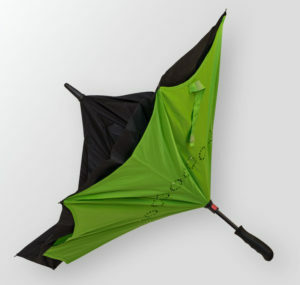 At about $5-$7 each, based on quantity, the cost of the Wedge is a bit more than your average desk promotional product. But, the potential end benefit is well worth the investment. To get pricing and product information for this desk item, visit our Wedge product page. 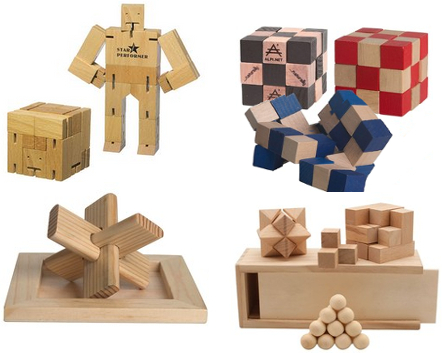 To learn about other attention-getting desk items like customized coasters or note cubes, click HERE to see our Counselor showroom. Or, if you want to contact us to discuss next steps, your dedicated Account Manager will help you get started. First on our list is the PopSocket. We’re seeing a lot of in-hand phone holders pop up (no pun intended) and knew the PopSocket had to be on our list. Just stick it to the back of almost any mobile device to transform your phone. 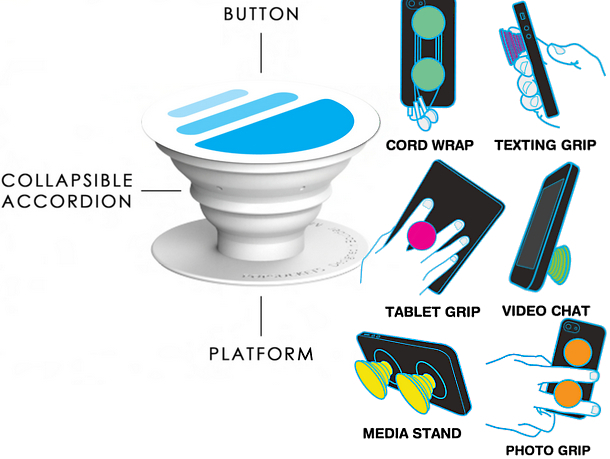 PopSockets “pop” whenever you need a grip, a stand, or an earbud-management system. We love these so much, Katie our Account Manager and Danielle our Marketing Manager currently have them on the back of their phones! With a large imprint area and many color combinations, PopSockets makes the perfect gift for students, admitted events, welcome packs, and more! It’s time to upgrade your poncho’s! We know you’ve seen poncho’s before, but never ones like these. Tough, heavy-duty, adult PVC Poncho with roomy hood is exactly what we’ve been waiting for! The quality and retail-like appearance makes these poncho’s a go-to for games, event outings, welcome packs, and alumni! 11 rich color options, front and back imprint areas, and snap closures creates a unique poncho that will be kept and reused for many events and years to come! With the New Year comes a great way to customize your items even further. 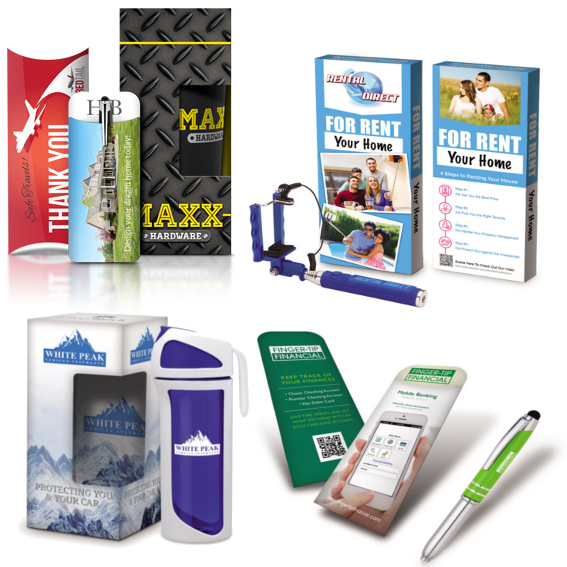 Now you can combine the power of promotional products with personalized packaging! Imagine taking a pair of promotional sunglasses and putting them in an individualized custom box. Custom packaging turns a gift into a true brand advocate, strengthening brand recognition, and adding perceived value! 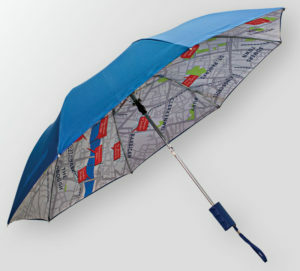 It’s also a great way to include more information to a promotional gift! Add organization to admitted events, alumni gatherings, and recognition ceremonies with custom boxes, sleeves, bindings, and more! With a retail-look, low prices, and low quantities custom packaging helps take your gifts to the next level. 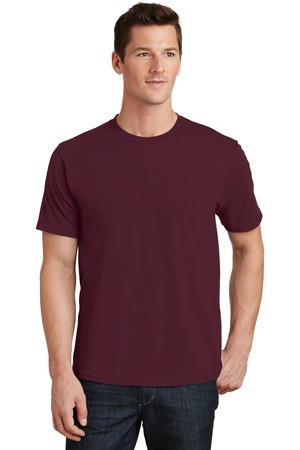 This 100% ring spun cotton tee is a softer, lighter, and more high end style of cotton that gives this a perfectly relaxed feel. Coming in sizes S-6XL the Fan Favorite Tee features that heathered appearance that’s on our Top Trends list of 2016. Not to mention, this tee already comes in 31 genuine Collegiate and Professional Sports Team colors! These tees are the premiere choice for volunteer days, admissions, and alumni events! 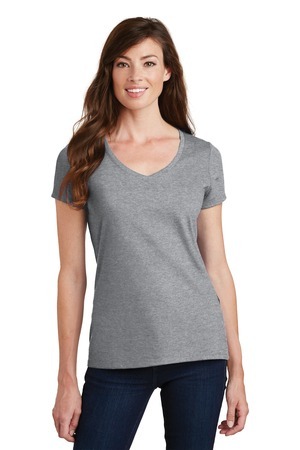 The Fan Favorite is the perfect lived-in tee that’s sure to be worn again and again. 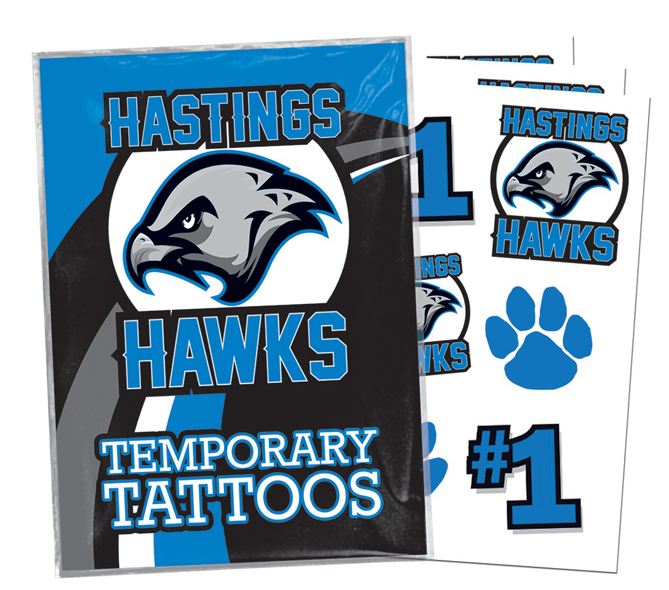 Time to liven up your direct mailers by adding a custom tattoo or scratch-off! Choose from their hundreds of stock designs or create your own. Available in the classic temporary, PrismFoil Metallic, Glow-in-the-Dark, Glitter, or Tear-Off. Temporary tattoos and scratch off’s are an interactive way for students to show their support at admitted events, sports outings, welcome week, and more! favorite emoji’s made the cut: Yikes, ILY, Wink Wink, Happy Face, and LOL. something on trend that student’s will not only recognize, appreciate, and keep then these are the ones for you! Bring brand recognition to students and faculties everyday lives with the all new Micro-USB to USB Cables. Phones aren’t leaving our hands anytime soon and unfortunately in 2016 our phones still need to be charged. Why not add your brand to an everyday much needed item? One of a kind, full-color, photo-quality imprinted cables highlights their precision, color, and high-definition detail on both sides. 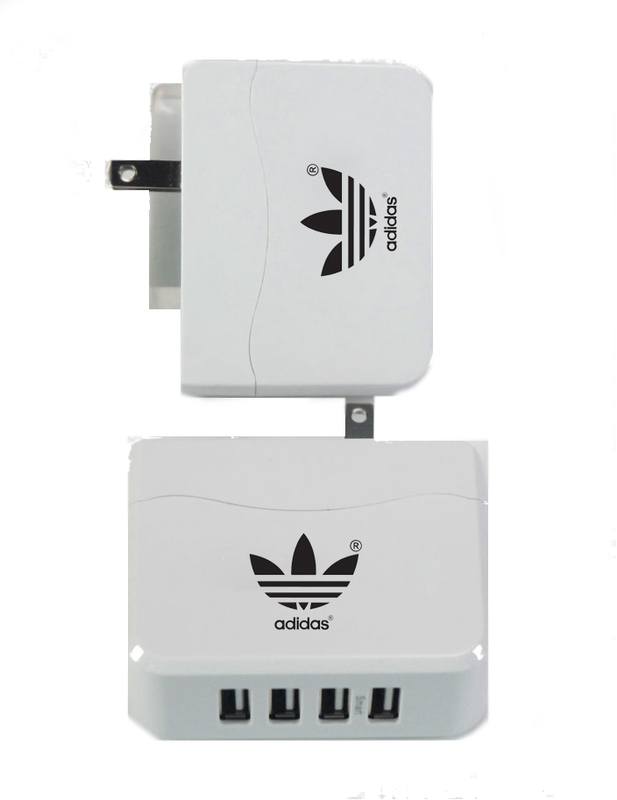 Compatible with all micro-USB ports including Apple®. This charging cord will stand out from the crowd and be the ultra-modern promotional gift that you’ll be thanked for! 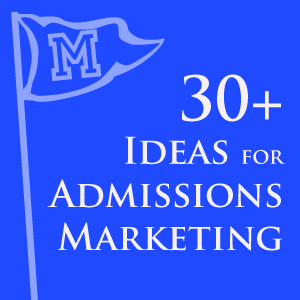 Great for admitted events, welcome gifts, alumni events, and more! Being eco-friendly is always a positive that’s why we added plantable paper to our top 10 list! Good old fashion paper can be replaced with all-natural seed paper to create endless promotional products! Bookmarks, coasters, coupons, postcards, greeting cards, letters, business cards , event invitations, and more! Adding eco-friendly materials to an everyday item creates memorability and helps our planet stay green! This is the perfect way for your students to show their support and school colors! The vinyl ultra-removable keyboard sticker offers brilliant digital color and durable material. 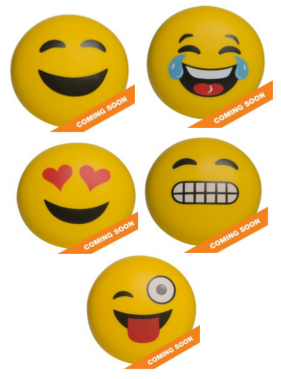 These are a fun and interactive item that we’re excited to feature this year! 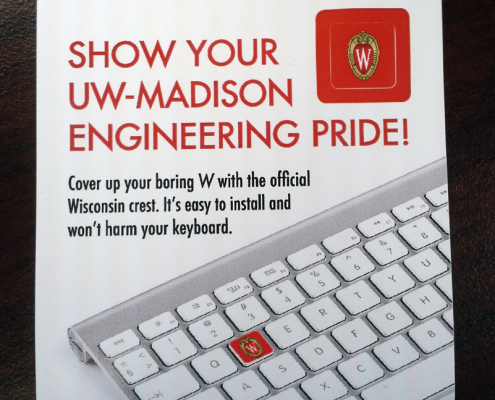 Individualize your departments by adding a custom keyboard sticker to computers or hand them out at admitted events! Did you ever think a published book could be a promotional product? Well now it can be! This unique product actually allows you to customize published books on the market. Everything from the Giving Tree to The College Dorm Survival Guide is available for customization. Modifications like a cover imprint, a page insert, a full color wrap, and custom book jacket are all possible with The Book Company. First of all, this is just cool! Have you ever seen anything like it? Books make incredible promotional items because books are kept, read, shared, and even displayed; never thrown away! We love the idea of books for welcome packs, scholarship events, recognition events, and even giveaways. EOS has come to the promotional products world and we couldn’t be more excited! These uniquely spherical lip balms made their explosive start in the retail world and their growth has only accelerated. Not only do we love the duo packaging option pictured above, we love EOS’s quality. Containing an antioxidant-rich formula featuring vitamin E and soothing shea butter, EOS keeps lips soft and moisturized throughout the work day. Nothing says thank you like an EOS Lip Balm. Consider these for employee appreciation, administrative professionals, or even health focused events. With 8 color and flavor options EOS’ take on the classic Lip Balm makes a great promotional gift with a large imprint area! This all new phone port is exactly what we’ve all been waiting for. With a simplistic and clean design it not only charges one phone, it can charge 4 at once. The twist on the modern phone port upgrades the use-ability, imprint area, and memorability of this great gift! Phone ports are great simply because everyone has a phone! They’re forever useful; but this port takes it to the next level. These are the perfect gifts to welcome new employees, staff giveaways, and even incentive programs. The Tile is a new product perfect for forgetful minds. 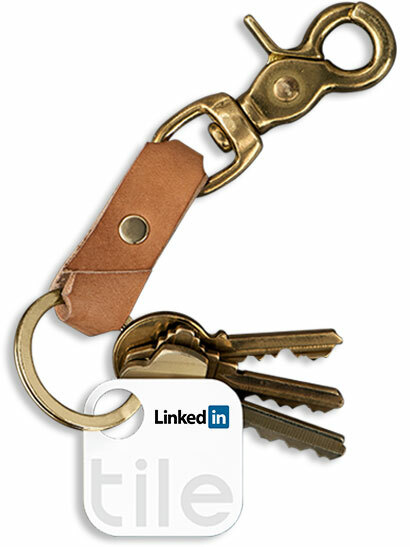 This device fits perfectly on your key ring and works to track your most needed daily items. Simply attach a Tile to an item, use The Tile App on your phone to locate it, and within seconds the Tile is chirping with sound to help you on your quest! Need to find your phone? Press the Tile to loudly ring your lost phone; it’ll even switch it off of silent mode in order to ring! The best part of the product is the app works to create a network of all Tile users across the world. That means if you’ve lost your phone at an airport or even another county, The Tile App will connect with other users Tile’s to help search for yours! Amazing right? We think so! Imagine a promotional gift like this one. Not only is this just extremely helpful, but it’s something that will be kept and used every day. When you include a company logo the value simply increases with more use. 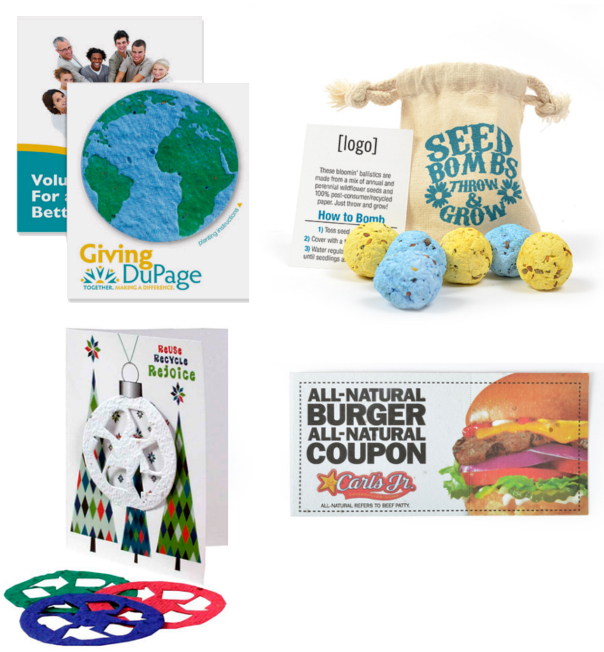 We think these are perfect gifts for administrative professional’s day, incentive programs, and giveaways! Let’s face it, we love our gadgets. Phones, laptops, tablets, headphones, speakers, etc. and not to mention all of the cords to go with them! Well that’s where the Gird-It steps in. 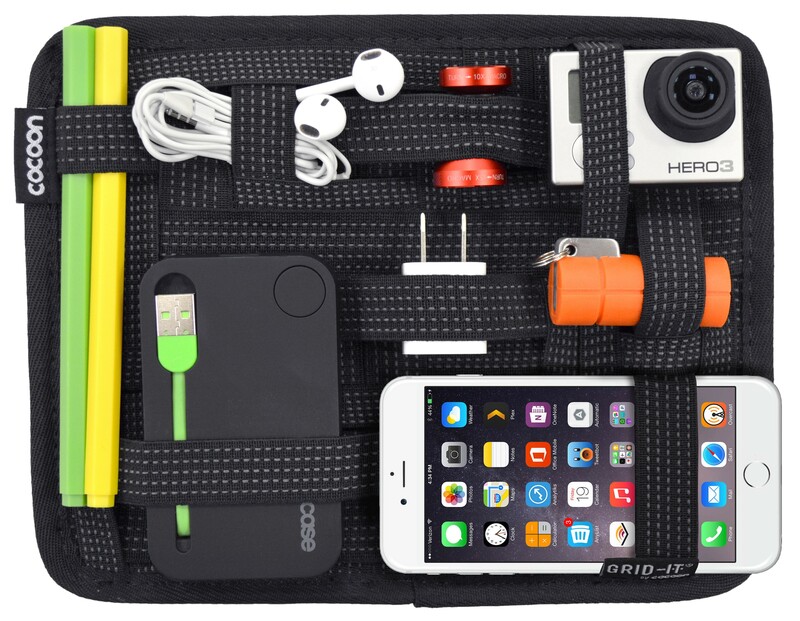 Organizing tech becomes a breeze with Grid-It’s unique weave of rubberized elastic bands perfect for holding personal objects firmly in place. This “tech trap” is designed to provide an endless configuration of objects, digital devices, and personal effects; making this a universally useful item. 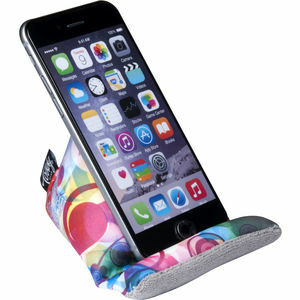 Our gadgets aren’t going away any time soon which makes this the perfect promotional gift! Your staff, engineers, designers, and everyone else will thank you for the added organization in their lives! Useful, modern, trending, personal, and a daily use item makes the Grid-It a true top 10! Did you ever think a published book could be a promotional product? Well now it can be! This unique product actually allows you to customize published books on the market. Everything from the Giving Tree to The Unofficial Mad Men Cookbook is available for customization. Modifications like a cover imprint, a page insert, a full color wrap, and custom book jacket are all possible with The Book Company. First of all, this is just cool! Have you ever seen anything like it? Books make incredible promotional items because books are kept, read, shared, and even displayed; never thrown away! We love books for recognition, business outreach, employee appreciate, and even giveaways. When you give the gift of reading; your clients won’t be disappointed! 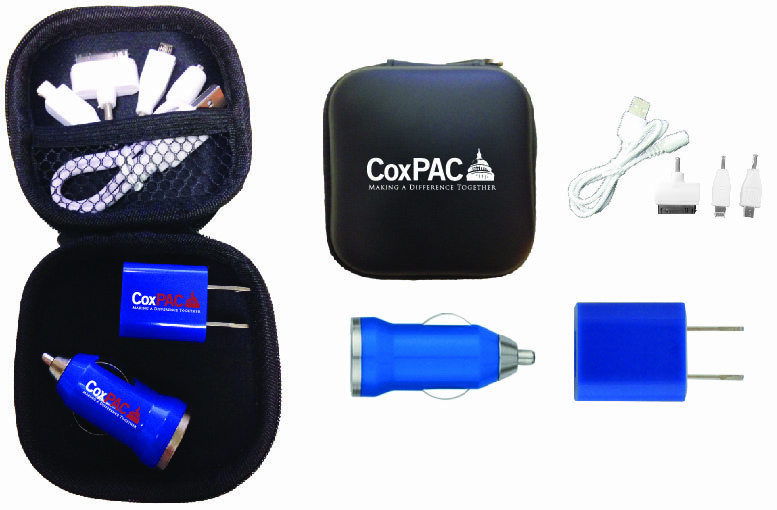 An easy way to bring your promotional gifts to the next level would be to “kit” them. To “kit” is an industry term we use to describe more than one item being bundled together in one gift. This is your one stop shop for a promotional gift. Everything from hats & t-shirts, water bottles, bags and water bottles, tech gear, and more can be kitted together! Kitted items make the perfect gifts for office incentive programs, health days, acknowledgement gifts, and more! Being eco-friendly is always a positive that’s why we added plantable paper to our top 10 list! Good old fashion paper can be replaced with all-natural seed paper to create memorability and helps our planet stay green! Greeting cards, letters, business cards, coasters, event invitations, and more! The possibilities are endless! Haven’t we all been to an event where we’re trying to hold an appetizer plate, a drink, and still have a free hand to golf, shake hands, or converse? Well The Gala puts us all to shame with its simple yet effective design. No more balancing cheese and crackers on top of your drink as you make introductions. This single-finger plate allows the beverage to easily nestle alongside it as it’s held in place by the user’s index finger. This is truly the ultimate cocktail plate to make the attendees of your next event mingle with ease! With a large imprint area and high quality heavyweight plastic there’s no doubt these will be a hit and make a lasting impression! No wood grain isn’t coming back (at least we hope not) but what is coming back is wood. That’s why we’ve included a few of the brand new wooden desk items of 2016. Wood has a high perceived value and is a relatively inexpensive material making these gifts a unique and affordable option. Wooden desk gifts are a great way to welcome new employees, recognize years of service, and ensure your brand is always top of mind! Do these look familiar? If they do you’re probably familiar with the brand Swell that’s taking the retail world by storm! 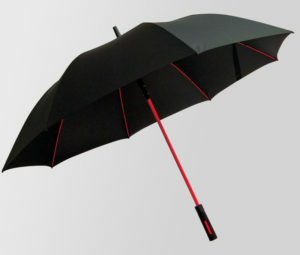 We’re staying on trend with our industries version, The Force! 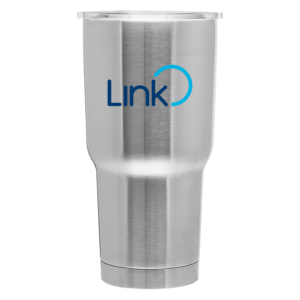 Double walled, stainless steel, thermal, with copper vacuum insulation available in sizes 34, 26, and 17 ounces. We are seeing these bottles everywhere! 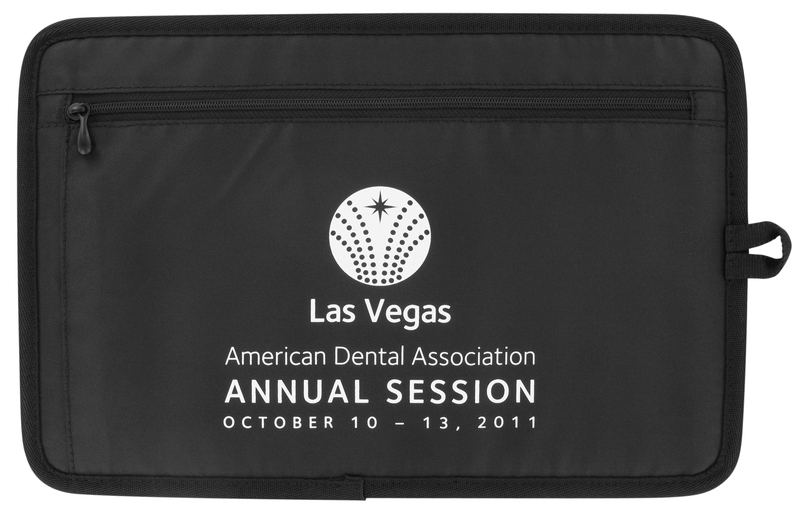 They’re trendy, extremely useful and features a huge customizable imprint area. 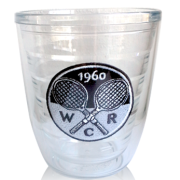 Perfect for health focused events/days, employee incentive programs, and holiday gifts! 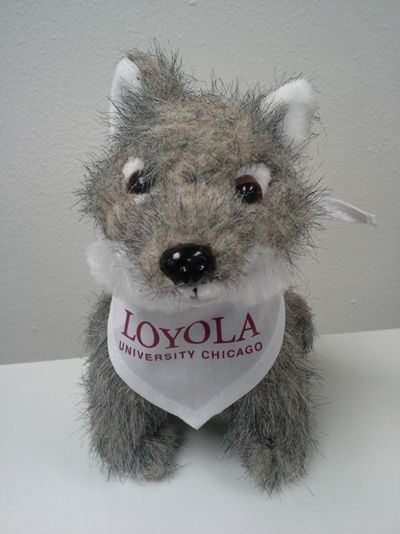 We partnered with Loyola First Year Experience to create this adorable gray wolf. Additional animals are available. You can dress your school’s little critter with either a bandanna or a t-shirt. For Milwaukee School of Engineering’s baseball themed promotional items last year, we created a Hank-inspired puppy for its Housing Department (the stray dog that the Brewers found at Spring Training). Interestingly enough, Hank also won Dog of the Year! 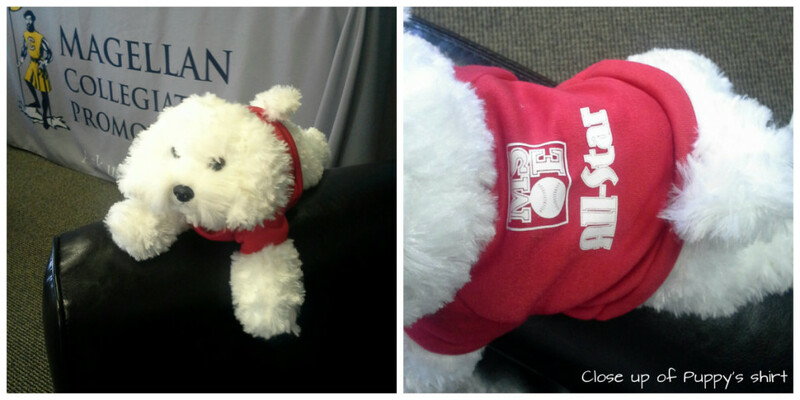 Both the Loyola wolf and MSOE puppy are two examples of cute, fun promotional products that recipients are sure to love. To search for more stuffed animal options, view this product search, or contact us for more details! In one of our most popular posts, Top New Promotional Products for Colleges, we shared a few desk-related promotional ideas that could be given to high school counselors. Note pads, stone coasters, tech-stickers, pennants, and phone holders are just a few ideas that we include in our High School Counselors Showroom. To keep on trend with new products in the industry, we wanted to spotlight a tech-related idea that high school counselors would find useful and fun. The Wedge™ Mobile Device Stand is a fully customizable, colorful desk item that also can be used as a screen cleaner. With 81% of all promotional products being kept because of usefulness, the Wedge will showcase your brand in a high-visibility work area for a long time. Helps keep device screens smudge free. The base can be used as a screen cleaner. Artwork is printed on a single piece of fabric, offering a fully custom imprint area with full color dye sublimation for vibrant graphics. The base of the Wedge is available in standard grey or black, though other special edition colors are now available for an extra punch of color. An antimicrobial coating prevents the buildup of mold, mildew, and odors. The fabric is 100% microfiber. 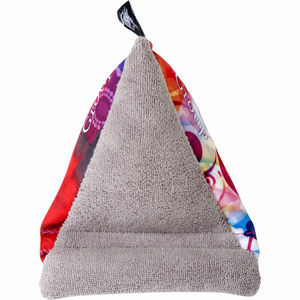 It’s extremely soft and the entire item has a bean-bag like feel, so it’s easy to hold onto when cleaning a screen. The Wedge is handmade in the USA. Here’s a picture of the phone stand in use. We recommend imprinting your brand name on the rounded, rectangle shape that is readily visible when the phone is in place for maximum exposure. In testing it out in our office, the Wedge held my phone at a comfortable angle, so it was both easy to read and touch the screen without sliding around my desk. Numerous colleagues are using the Wedge on their own desks because it’s such a functional and fun product. It’s bound to be appreciated and will help keep your school top of mind with school counselors or other referral sources. Want more ideas? See our High School Counselors Showroom or contact us to discuss your recruitment plans. As part of Magellan Promotions’ Giving Back Initiative, we participated in spring clean-up activities on Saturday, April 18th. 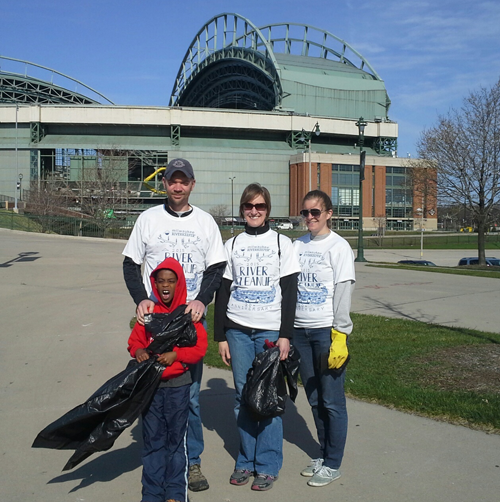 Along with Friends of the Hank Aaron State Trail and Milwaukee Riverkeeper, our Magellan crew of six ventured around Miller Park area, the largest volunteer site for the event. In all, over 4000 volunteers would be cleaning up at 50 sites in the area! Across town Julia Buraczewski volunteered at a clean up at Kletzsch Park. This marked the 20th Anniversary of the River Cleanup for Milwaukee Riverkeepers. 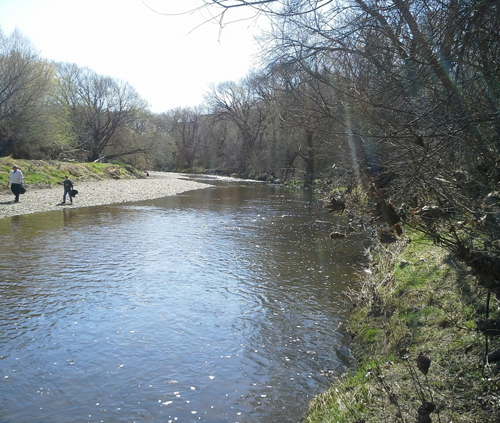 Their main goal is to make rivers fish-able and swim-able. Everyone who volunteered received a t-shirt with a fun design and numerous sponsor logos on the back. As a promotional products company who runs t-shirts, we ALWAYS recommend t-shirts for volunteer days. It’s a great way for River Keepers to gain more exposure in the community each time a volunteer wears and re-wears the shirt. Can you believe we found THIS in the river?! As you can imagine, a lot of plastic bags, plastic packaging, and broken glass bottles were found along the trail. In some cases, larger pieces of debris were in and around the river. 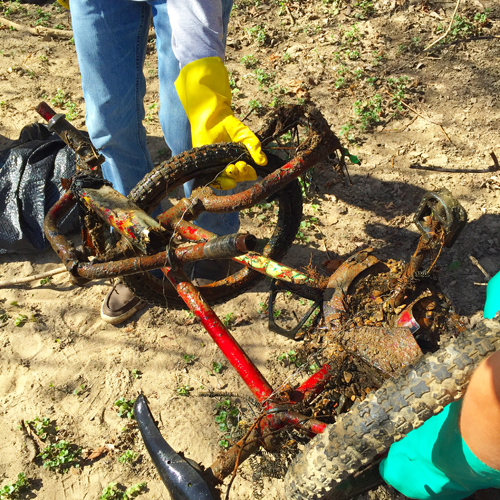 Our crew noticed a tire sticking out of the edge of the river and realized an entire kid’s bike was in there! With a few extra hands and some elbow grease, three people pulled THIS out of the river. Sunny day along the river. We’ll have to revisit the trail when everything is in full bloom! It really is a beautiful space – one that we were happy to help clean-up as a small way of giving back. Let us know if you participate in a spring clean up! Happy Earth Day! As part of our Giving Back initiative, Magellan Promotions provides monetary donations and creates promotional items at cost to help non-profit organizations stretch their funds to better support their mission. 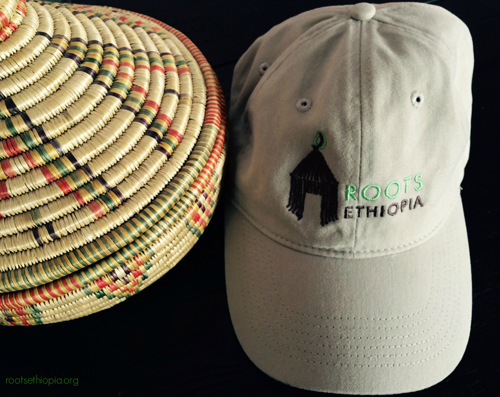 Roots Ethiopia – an organization that we supported through at-cost production of items – recently shared their story of their field team, who enthusiastically used the field bags and hats that we created. 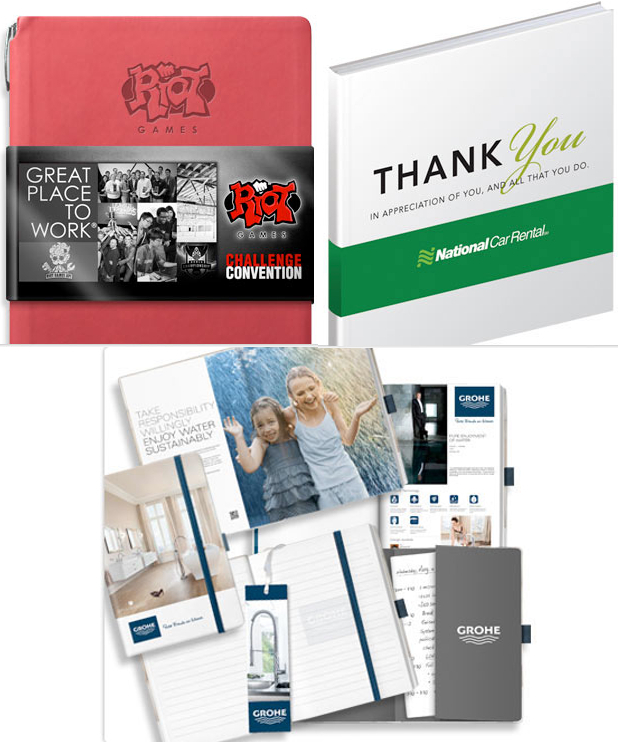 Here is a brief overview of the organization and how these promotional products impacted their work. 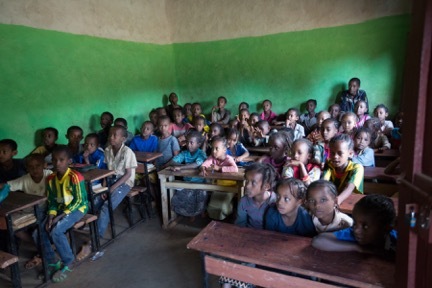 Supporting education and job creation in Southern Ethiopia is the main mission of Roots Ethiopia. 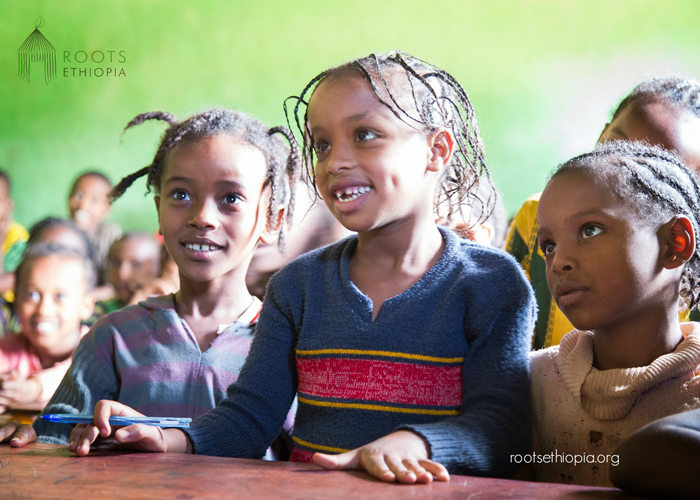 Learn more about their organization and mission by visiting their website at www.rootsethiopia.org. We have had the pleasure of working with the organization’s founder, Meghan Walsh, who was kind enough to share their story of their recent trip to Ethiopia. 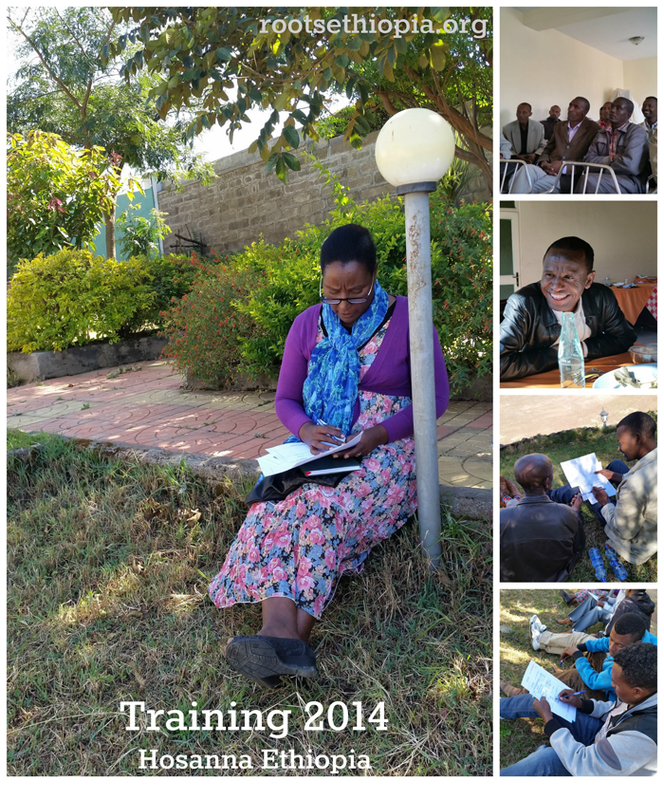 In December2014, Roots Ethiopia sent a team to Ethiopia for training and projects with field partner Meserete Kristos Church’s Hosanna Regional Office. The field team does everything locally, traveling by foot or public bus. Days are long and travel is slow, which makes field bags a desirable item, especially since they are difficult to find locally. Close up of the messenger style bag used. Images from the training session. The baseball caps that were ordered at cost were passed out to all of the VIP assistants on the trip -drivers, translators, bag carriers, etc. This was a great way to show appreciation and raise awareness for Roots Ethiopia. 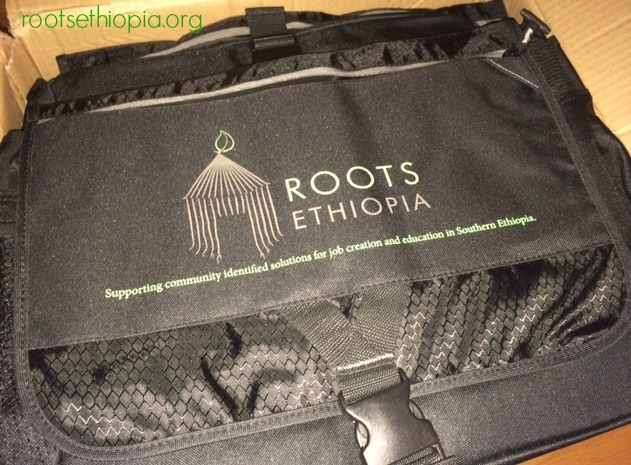 It was so very rewarding to know that our promotional items were extremely appreciated and put to good use by the Roots Ethiopia organization! Such small things, such as a field bag or baseball cap, can have a much greater meaning and make a big difference, as Meghan described above. 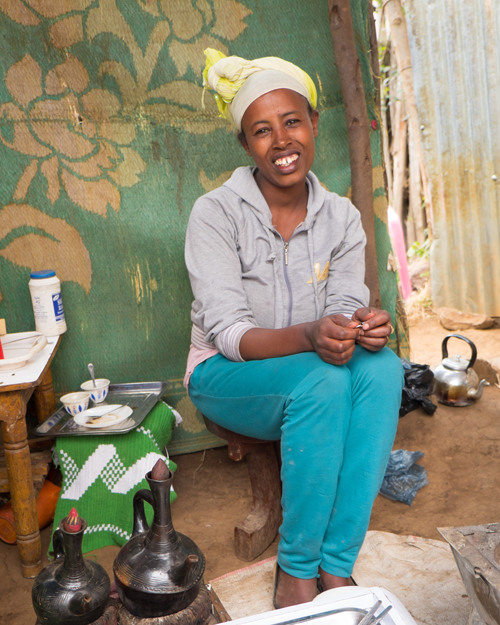 For more stories on how Roots Ethiopia has made a difference for families and children, read about Tsehainesh pictured here. Did you know coffee can change a life? It did for her! They are currently raising funds for education. Here are a few pictures from their visit to schools they support with essential learning resources. Their field partner strives to make school a reality for many students. From supporting small business start-ups like Tsehainesh to sending children to school, Roots Ethiopia’s work and mission is truly inspiring. We were happy to play a small part through promotional items used on their trip. Thanks again to Meghan for sharing their story!